Flavius Iulius Constans Augustus was Roman Emperor from 337 to 350. He was the third and youngest son of Constantine the Great and Fausta, his father's second wife. 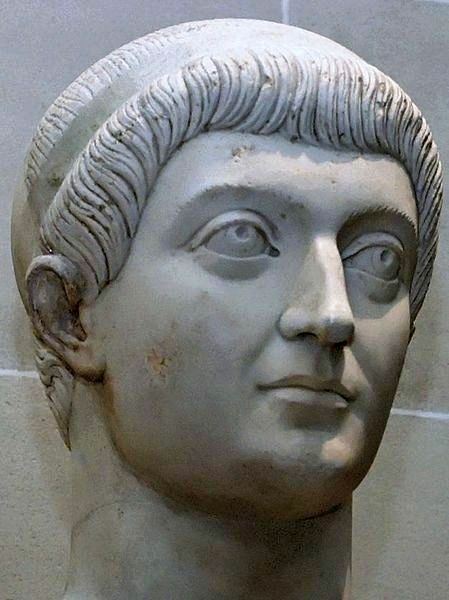 With Constantine’s death in 337, Constans and his two brothers, Constantine II and Constantius II, divided the Roman world between themselves and disposed of virtually all relatives who could possibly have a claim to the throne. Constans was initially under the guardianship of Constantine II, but following a dispute over territory, Constans defeated his brother in 340. In the final years of his reign, Constans developed a reputation for cruelty and misrule. Dominated by favourites and openly preferring his barbarian bodyguard, he lost the support of the legions. In 350, the general Magnentius declared himself emperor. Constans lacked any support beyond his immediate household, and was forced to flee for his life. He was caught and killed shortly afterwards.